Design geeks among you may know that Garden Design magazine folded early last year. I had regretful yet mixed feelings about this, because the magazine’s focus on designing a garden, rather than on the minutiae of actually growing a garden, was unique and I immediately felt the lack. However, I confess that the old Garden Design magazine didn’t always live up to its potential for me, because their focus was so often on palatial estates covered in lawn and boxwood. I love to see aspirational photos of gorgeous landscapes, but my favorite part of reading about design is that I can, with a little bit of thought, figure out how to take the ideas and inspiration from those landscapes and apply them to my own backyard or those of my clients. And that’s where the new Garden Design magazine really steps up. The NEW Garden Design? Yep, you heard right! It’s been re-invigorated and re-imagined, and while it is still focused on high-end, classy design, it also provides insights that real people like you and I can benefit from. 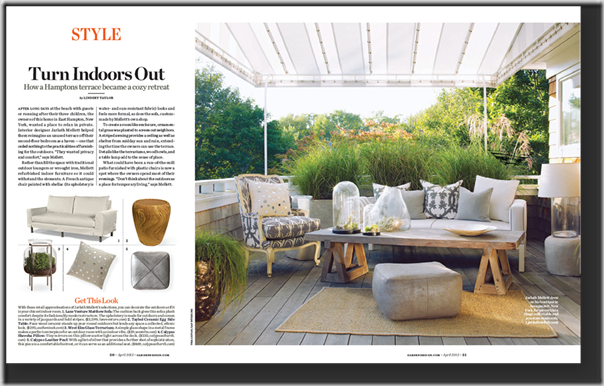 Innovative ideas from up-and-comers in the field, new ways of thinking about landscapes from iconic designers, and the practical details, strategies, and stylish tricks you need to get the look in your own outdoor space. How do I know? I’m one of the contributing editors, and have been working behind the scenes as a consultant and writer for the last year. It’s been amazing helping to re-envision Garden Design, and seeing the talented crew bring all of the people and ideas together. The magazine is innovative in more than one way. The world of publishing has been changing, and many magazines have been engaged in a race to the bottom, with cheap subscriptions paid for by packing the pages with advertising, junk content with paid product placements, and so little real journalism and information that they are hardly worth reading. Garden Design is taking the opposite strategy. This is an ad-free quarterly journal with gorgeous professional photography, engaging writers, and 132 luxurious pages you’ll want to refer back to time and time again. With no advertisements, every page is packed full of glossy design spreads. I wrote one of the feature articles for this first issue, in which I interviewed top designers on creating inspired backyards (and the tips they shared have already changed how I approach a landscaping plan). 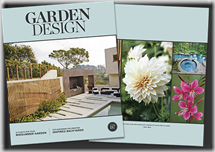 I hope you’ll join me in subscribing to the new Garden Design magazine. I’m pleased and proud to be a part of it! leaving a comment to be entered in the drawing for June 2nd. Love the yoga gardens. simplicity with space as design. Found your website when I was researching organic slug and snail killer options. Love it!